Thyme is a member of the Labiatae family and is native to the Mediterranean. It has been known as a medicinal plant since early civilization. 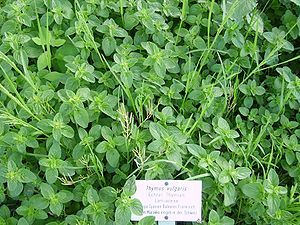 The latin name for common Thyme is Thymus vulgaris. It is often used to treat cough, cold and sore throat and as a general disinfectant. Thyme is very stimulating to the respiratory system, and can be used during steam inhalation or as a mouthwash or gargle. 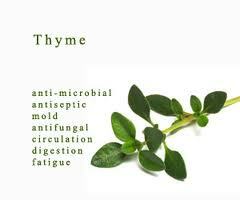 Thyme stimulates white blood cell production, strengthening the bodies immune system. It has been used for fatigue and depression and to raise low blood pressure. Some say it improves memory and brain function. Thyme can be used in a compress for infections and wounds. It is useful when added to soaps or lotions as a disinfectant, and is excellent for insect bites or bee stings. I use it often in steam inhalations. I boil 1 quart of purified water and pour it into a ceramic bowl. I place a heavy bath towel over my head and breathe deeply. I add one drop of Thyme oil and breathe this in until it has dissipated. Then I follow that with 1 drop of Tea Tree Oil and 1 drop of Eucalyptus Oil. I find it helps to kick any kind of infection or cold that I may be struggling to fight off. I would suggest tying your hair back and protecting your skin from the hot steam with a thin layer of jojoba or coconut oil. I have delicate skin and it gets really dry if I don’t do this first. Steam inhalations are great for cleaning out your pores too, especially if you apply oil first. Its like the Oil-cleansing method on steroids 🙂 If you are using this for children or those with senstive skin, I would suggest diluting it in oil first. Has anyone made their own Essential Oil? I would love to learn how to do that! All material on this website is provided for your information only and may not be construed as medical advice or instruction. No action or inaction should be taken based solely on the contents of this information; instead, readers should consult appropriate health professionals on any matter relating to their health and well-being. The information and opinions expressed here are believed to be accurate, based on the best judgement available to the authors, and readers who fail to consult with appropriate health authorities assume the risk of any injuries. This sounds great! I’ve never worked with essential oil of thyme before. I guess I have to go get some soon! Enter your email address to follow this blog and receive notifications of new posts by email. Welcome!